Welcome, and thanks for using Referron! When you use our products and services, you're agreeing to our terms, so please take a few minutes to read over the User Agreement below. We are a social referral network for business. The mission of Referron is to enable people to refer to businesses or people who they know like and trust, with ease, and have those referrals tracked and rewarded. To achieve our mission, we make services available through our website, mobile applications, and developer platform, to help you, your connections, and millions of other businesses connect and refer to people you know like and trust. When you use Referron, you are entering into a legal agreement and you agree to all of these terms. You will follow the law and Referron’s rules. You own the information you provide Referron under this Agreement, and may request its deletion at any time, unless you have shared information or content with others and they have not deleted it, or it was copied or stored by other users. Additionally, you grant Referron a nonexclusive, irrevocable, worldwide, perpetual, unlimited, assignable, sublicenseable, fully paid up and royalty-free right to us to copy, prepare derivative works of, improve, distribute, publish, remove, retain, add, process, analyze, use and commercialize, in any way now known or in the future discovered, any information you provide, directly or indirectly to Referron, including, but not limited to, any user generated content, ideas, concepts, techniques and/or data to the services, you submit to Referron, without any further consent, notice and/or compensation to you or to any third parties. Any information you submit to us is at your own risk of loss. By providing information to us, you represent and warrant that you are entitled to submit the information and that the information is accurate, not confidential, and not in violation of any contractual restrictions or other third party rights. It is your responsibility to keep your Referron profile information accurate and updated. To be eligible to use the Service, you must meet the following criteria and represent and warrant that you: (1) are the “Minimum Age” (defined below) or older; (2) are not currently restricted from the Services, or not otherwise prohibited from having a Referron account, (3) are not a competitor of Referron or are not using the Services for reasons that are in competition with Referron; (4) will only maintain one Referron account at any given time; (5) will use your real name and only provide accurate information to Referron; (6) have full power and authority to enter into this Agreement and doing so will not violate any other agreement to which you are a party; (7) will not violate any rights of Referron or third party, including intellectual property rights such as copyright or trademark rights; and (8) agree to provide at your cost all equipment, software, mobile access, and internet access necessary to use the Services. The profile you create on Referron will become part of Referron and except for the information that you license to us is owned by Referron. However, between you and others, your account belongs to you. You agree to: (1) keep your password secure and confidential; (2) not permit others to use your account; (3) not use other’s accounts; (4) not sell, trade, or transfer your Referron account to another party; and (5) not charge anyone for access to any portion of Referron, or any information therein. Further, you are responsible for anything that happens through your account until you close down your account or prove that your account security was compromised due to no fault of your own. 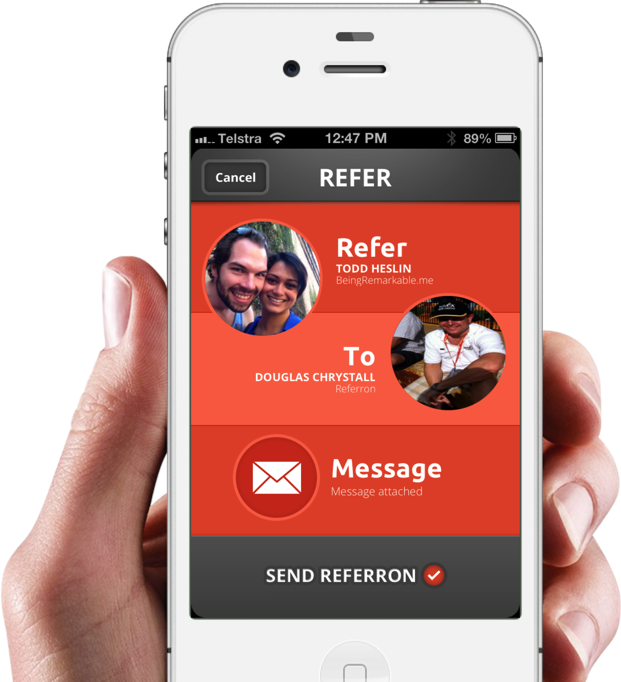 To close your account, please visit Referron’s Help Center. You agree to indemnify us and hold us harmless for all damages, losses and costs (including, but not limited to, reasonable attorneys’ fees and costs) related to all third party claims, charges, and investigations, caused by (1) your failure to comply with this Agreement, including, without limitation, your submission of content that violates third party rights or applicable laws, (2) any content you submit to the Services, and (3) any activity in which you engage on or through Referron. You will honour your payment obligations and you are okay with us storing your payment information. Also, there may be fees and taxes that are added to our prices. If you purchase any services that we offer for a fee, either on a one-time or subscription basis (“Premium Services”), you agree to Referron storing your payment information. You also agree to pay the applicable fees for the Premium Services (including, without limitation, periodic fees for premium accounts) as they become due plus all related taxes, and to reimburse us for all collection costs and interest for any overdue amounts. Failure to pay may result in the termination of your subscription. Depending on where you transact with us, the type of payment method used and where your payment method was issued, your transaction with us may be subject to foreign exchange fees or differences in prices, including because of exchange rates. Referron does not support all payment methods, currencies or locations for payment. Your obligation to pay fees continues through the end of the subscription period during which you cancel your subscription. All applicable taxes are calculated based on the billing information you provide us at the time of purchase. You may cancel or suspend your Premium Services here. Referron’s refund policy is explained here. We do not guarantee refunds for lack of usage or dissatisfaction. You also acknowledge that Referron’s Premium Services are subject to this Agreement and any additional terms related to the provision of the Premium Service. Additionally, if you require a printed invoice for your transaction with us, you may access it through your Referron account settings under “Purchase History.” request one by contacting our Customer Support. For purposes of service messages and notices about the Services, Referron may place a banner notice across its pages to alert you to certain changes such as modifications to this Agreement. Alternatively, notice may consist of an email from Referron to an email address associated with your account, even if we have other contact information. You also agree that Referron may communicate with you through your Referron account or through other means including email, mobile number, telephone, or delivery services including the postal service about your Referron account or services associated with Referron. Please review your Settings to control what kind of messages you receive from Referron. You acknowledge and agree that we shall have no liability associated with or arising from your failure to do so maintain accurate contact or other information, including, but not limited to, your failure to receive critical information about the Service. Referron may offer the Services through applications built using Referron’s platform (“Referron Applications”). Examples of Referron Applications include its smart phone applications (Referron for Android, Referron for Blackberry or Referron for iPhone), and Referron’s “Share” buttons and other interactive plugins distributed on websites across the web. Referron Applications are distinct from third party Platform Applications. If you use a Referron Application or interact with a website that has deployed a plugin, you agree that information about you and your use of the Services, including, but not limited to, your device, your mobile carrier, your internet access provider, your physical location, or web pages containing Referron plugins that load in your browser may be communicated to us. Further, by importing any of your Referron data through the Referron Application, you represent that you have authority to share the transferred data with your mobile carrier or other access provider. In the event you change or deactivate your mobile account, you must promptly update your Referron account information to ensure that your messages are not sent to the person that acquires your old number and failure to do so is your responsibility. You acknowledge you are responsible for all charges and necessary permissions related to accessing Referron through your mobile access provider. Therefore, you should check with your provider to find out if the Services are available and the terms for these services for your specific mobile devices. Finally, by using any downloadable application to enable your use of the Services, you are explicitly confirming your acceptance of the terms of the End User License Agreement associated with the application provided at download or installation, or as may be updated from time to time. Referron offers various forums such as Referron Groups, Answers, and Network Updates, where you can post your observations and comments on designated topics. Referron also enables sharing of information by allowing users to post updates, including links to news articles and other information such as job opportunities, product recommendations, and other content to their profile and other parts of the site, such as Referron Groups and Referron Company Pages. Referron members can create Referron Groups and Company Pages for free, however, Referron, in its sole discretion, may close or transfer Referron Groups or Company Pages, or remove content from them if the content violates this Agreement or others’ intellectual property rights. Please note that ideas you post and information you share may be seen and used by other Members, and Referron cannot guarantee that other Members will not use the ideas and information that you share on Referron. Therefore, if you have an idea or information that you would like to keep confidential or don’t want others to use, or that is subject to third party rights that may be infringed by your sharing it, do not post it to any Referron Group, into your Network Updates, or elsewhere on Referron. REFERRON IS NOT RESPONSIBLE FOR A ANOTHER’S MISUSE OR MISAPPROPRIATION OF ANY CONTENT OR INFORMATION YOU POST ON REFERRON. Your use of Referron services, including our software, is subject to export and re-export control laws and regulations, including the Export Administration Regulations (“EAR”) maintained by the United States Department of Commerce and sanctions programs maintained by the Treasury Department's Office of Foreign Assets Control. You shall not — directly or indirectly — sell, export, re-export, transfer, divert, or otherwise dispose of any software or service to any end-user without obtaining the required authorizations from the appropriate government authorities. You also warrant that you are not prohibited from receiving US origin products, including services or software. By submitting ideas, suggestions, documents, or proposals ("Contributions") to Referron through its suggestion or feedback webpages, you acknowledge and agree that: (a) your Contributions do not contain confidential or proprietary information; (b) Referron is not under any obligation of confidentiality, express or implied, with respect to the Contributions; (c) Referron shall be entitled to use or disclose (or choose not to use or disclose) such Contributions for any purpose, in any way, in any media worldwide; (d) Referron may have something similar to the Contributions already under consideration or in development; (e) you irrevocably non-exclusively license to Referron rights to exploit your Contributions; and (f) you are not entitled to any compensation or reimbursement of any kind from Referron under any circumstances. If you follow this agreement, we grant you a limited right to use Referron. You will only access and use Referron in the way this agreement allows you. On the condition that you comply with all your obligations under this Agreement, including, but not limited to, the Do’s and Don’ts listed in Section 10, we grant you a limited, revocable, nonexclusive, nonassignable, nonsublicenseable license and right to access the Services, through a generally available web browser, mobile device or Referron authorized application (but not through scraping, spidering, crawling or other technology or software used to access data without the express written consent of Referron or its Members), view information and use the Services that we provide on Referron webpages and in accordance with this Agreement. Any other use of Referron contrary to our mission and purpose (such as seeking to connect to someone you do not know or trust, or to use information gathered from Referron commercially unless expressly authorized by Referron) is strictly prohibited and a violation of this Agreement. We reserve all rights not expressly granted in this Agreement, including, without limitation, title, ownership, intellectual property rights, and all other rights and interest in Referron and all related items, including any and all copies made of the Referron website. For as long as Referron continues to offer the Services, Referron shall provide and seek to update, improve and expand the Services. As a result, we allow you to access Referron as it may exist and be available on any given day and we have no other obligations, except as expressly stated in this Agreement. We may modify, replace, refuse access to, suspend or discontinue Referron, partially or entirely, or change and modify prices prospectively for all or part of the Services for you or for all our Members in our sole discretion. All of these changes shall be effective upon their posting on Referron or by direct communication to you unless otherwise noted. Referron further reserves the right to withhold, remove or discard any content available as part of your account, with or without notice if deemed by Referron to be contrary to this Agreement. For avoidance of doubt, Referron has no obligation to store, maintain or provide you a copy of any content that you or other Members provide when using the Services. Third parties may offer their own products and services through Referron, and we are not responsible for these third-party activities. You are solely responsible for your interactions with other Members. Referron may limit the number of connections you may have to other Members and may, in certain circumstances, prohibit you from contacting other Users through use of the Services or otherwise limit your use of the Services. Referron reserves the right, but has no obligation, to monitor disputes between you and other members and to restrict, suspend, or close your account if Referron determines, in our sole discretion, that doing so is necessary to enforce this Agreement. The Service includes the copyrights and Intellectual property rights of Referron and except for the limited license granted to you in Section 3, Referron reserves all of its intellectual property rights in the Service. Referron, the Referron and “in” logos and other Referron trademarks, service marks, graphics, and logos used in connection with Referron are trademarks or registered trademarks of Referron in the U.S. and/or other countries. Other trademarks and logos used in connection with Referron may be the trademarks of their respective owners. This Agreement does not grant you any right or license with respect to any such trademarks and logos. We disclaim any legal liability for the quality, safety, or reliability of Referron. SOME COUNTRIES AND JURISDICTIONS DO NOT ALLOW THE DISCLAIMER OF IMPLIED TERMS IN CONTRACTS WITH CONSUMERS AND AS A RESULT THE CONTENTS OF THIS SECTION MAY NOT APPLY TO YOU. DO NOT RELY ON REFERRON OR ITS SUPPLIERS, ANY INFORMATION THEREIN, OR ITS CONTINUATION. WE PROVIDE THE PLATFORM FOR REFERRON AND ALL INFORMATION AND SERVICES ON AN “AS IS” AND “AS AVAILABLE” BASIS. REFERRON DOES NOT CONTROL OR VET USER GENERATED CONTENT FOR ACCURACY. WE DO NOT PROVIDE ANY EXPRESS WARRANTIES OR REPRESENTATIONS. TO THE FULLEST EXTENT PERMISSIBLE UNDER APPLICABLE LAW, REFERRON AND ITS SUPPLIERS DISCLAIM ANY AND ALL IMPLIED WARRANTIES AND REPRESENTATIONS, INCLUDING, WITHOUT LIMITATION, ANY WARRANTIES OF MERCHANTABILITY, FITNESS FOR A PARTICULAR PURPOSE, TITLE, ACCURACY OF DATA, AND NONINFRINGEMENT. IF YOU ARE DISSATISFIED OR HARMED BY REFERRON OR ANYTHING RELATED TO REFERRON, YOU MAY CLOSE YOUR REFERRON ACCOUNT AND TERMINATE THIS AGREEMENT IN ACCORDANCE WITH SECTION 7 (“TERMINATION”) AND SUCH TERMINATION SHALL BE YOUR SOLE AND EXCLUSIVE REMEDY. REFERRON IS NOT RESPONSIBLE, AND MAKES NO REPRESENTATIONS OR WARRANTIES FOR THE DELIVERY OF ANY MESSAGES (SUCH AS INMAILS, POSTING OF ANSWERS OR TRANSMISSION OF ANY OTHER USER GENERATED CONTENT) SENT THROUGH REFERRON TO ANYONE. IN ADDITION, WE NEITHER WARRANT NOR REPRESENT THAT YOUR USE OF THE SERVICE WILL NOT INFRINGE THE RIGHTS OF THIRD PARTIES. ANY MATERIAL, SERVICE, OR TECHNOLOGY DESCRIBED OR USED ON THE WEBSITE MAY BE SUBJECT TO INTELLECTUAL PROPERTY RIGHTS OWNED BY THIRD PARTIES WHO HAVE LICENSED SUCH MATERIAL, SERVICE, OR TECHNOLOGY TO US. REFERRON DOES NOT HAVE ANY OBLIGATION TO VERIFY THE IDENTITY OF THE PERSONS SUBSCRIBING TO ITS SERVICES, NOR DOES IT HAVE ANY OBLIGATION TO MONITOR THE USE OF ITS SERVICES BY OTHER USERS OF THE COMMUNITY; THEREFORE, REFERRON DISCLAIMS ALL LIABILITY FOR IDENTITY THEFT OR ANY OTHER MISUSE OF YOUR IDENTITY OR INFORMATION BY OTHERS. REFERRON DOES NOT GUARANTEE THAT THE SERVICES IT PROVIDES WILL FUNCTION WITHOUT INTERRUPTION OR ERRORS IN FUNCTIONING. IN PARTICULAR, THE OPERATION OF THE SERVICES MAY BE INTERRUPTED DUE TO MAINTENANCE, UPDATES, OR SYSTEM OR NETWORK FAILURES. REFERRON DISCLAIMS ALL LIABILITY FOR DAMAGES CAUSED BY ANY SUCH INTERRUPTION OR ERRORS IN FUNCTIONING. FURTHERMORE, REFERRON DISCLAIMS ALL LIABILITY FOR ANY MALFUNCTIONING, IMPOSSIBILITY OF ACCESS, OR POOR USE CONDITIONS OF THE REFERRON SITE DUE TO INAPPROPRIATE EQUIPMENT, DISTURBANCES RELATED TO INTERNET SERVICE PROVIDERS, TO THE SATURATION OF THE INTERNET NETWORK, AND FOR ANY OTHER REASON. Not apply to any damage that Referron may cause you intentionally or knowingly in violation of this Agreement or applicable law, or as otherwise mandated by applicable law that cannot be disclaimed in this Agreement. You may terminate this Agreement, for any or no reason, at any time, with notice to Referron pursuant to Section 9.C. This notice will be effective upon Referron processing your notice. Referron may terminate this Agreement and your account for any reason or no reason, at any time, with or without notice. This cancellation shall be effective immediately or as may be specified in the notice. For avoidance of doubt, only Referron or the party paying for the services may terminate your access to any Premium Services. Termination of your Referron account includes disabling your access to Referron and may also bar you from any future use of Referron. Referron may restrict, suspend or terminate the account of any Member who abuses or misuses the Services. Misuse of the Services includes inviting other Members with whom you do not know to connect; abusing the Referron messaging services; creating multiple or false profiles; using the Services commercially without Referron’s authorization, infringing any intellectual property rights, violating any of the Do’s and Don’ts listed in Section 10, or any other behavior that Referron, in its sole discretion, deems contrary to its purpose. In addition, and without limiting the foregoing, Referron has adopted a policy of terminating accounts of Members who, in Referron’s sole discretion, are deemed to be repeat infringers under the United States Copyright Act. Upon termination of your Referron account, you lose access to the Services. The terms of this Agreement shall survive any termination, except Section 3 (“Your Rights”) and Sections 4(a) (b) and (d) (“Our Rights and Obligations”). This Agreement or any claim, cause of action or dispute (“claim”) arising out of or related to this Agreement shall be governed by the laws of the state of California regardless of your country of origin or where you access Referron, and notwithstanding of any conflicts of law principles and the United Nations Convention for the International Sale of Goods. You and Referron agree that all claims arising out of or related to this Agreement must be resolved exclusively by a state or federal court located in Santa Clara County, California, except as otherwise agreed by the parties or as described in the Arbitration Option paragraph below. You and Referron agree to submit to the personal jurisdiction of the courts located within Santa Clara County, California for the purpose of litigating all such claims. Notwithstanding the above, you agree that Referron shall still be allowed to apply for injunctive remedies (or an equivalent type of urgent legal relief) in any jurisdiction. In addition to Section 2.h. (“Notices and Service Messages”), we may notify you via postings on www.Referron.com. You may contact us here. Or via mail or courier at: Referron Corporation ATTN: Legal Department Referron Boston Address) Additionally, Referron accepts service of process at this address. Any notices that you provide without compliance with this section shall have no legal effect. You agree that this Agreement constitutes the entire, complete and exclusive agreement between you and Referron regarding the Services and supersedes all prior agreements and understandings, whether written or oral, or whether established by custom, practice, policy or precedent, with respect to the subject matter of this Agreement. You also may be subject to additional terms and conditions that may apply when you use or purchase certain other Referron services, third-party content or third party software. Our failure to act with respect to a breach of this Agreement by you or others does not waive our right to act with respect to that breach or subsequent similar or other breaches. Except as expressly and specifically contemplated by the Agreement, no representations, statements, consents, waivers or other acts or omissions by any Referron Affiliate shall be deemed legally binding on any Referron Affiliate, unless documented in a physical writing hand signed by a duly appointed officer of Referron. You waive your rights to try to stop Referron, but we don’t waive our rights to ask a court to stop your actions. Entities other than Mobifiliate Pty Ltd owns a 50% or greater interest in (“Affiliate”) are not parties, but intended third party beneficiaries of this Agreement, with a right to enforce this Agreement directly against you. You may not assign or delegate any rights or obligations under the Agreement. Any purported assignment and delegation shall be ineffective. We may freely assign or delegate all rights and obligations under the Agreement, fully or partially without notice to you. We may also substitute, by way of unilateral novation, effective upon notice to you, Referron Corporation for any third party that assumes our rights and obligations under this Agreement. Here’s a list of some of the specific things we ask you to do and not do on Referron. If you want a high-level summary of these, please check out our Professional Community Guidelines. If you think someone has stolen or misused your intellectual property on Referron, please check out our Copyright Policy. We built Referron to help you be a more successful business, and to help business succeed. To achieving this purpose, we encourage our Members to share truthful and accurate information. We also respect the intellectual property rights of others. Accordingly, this Agreement requires that information posted by Members be accurate and not in violation of the intellectual property rights or other rights of third parties. To promote these objectives, Referron provides a process for submission of complaints concerning content posted by our Members. Our policy and procedures can be found here: Referron Copyright Policy. Claims regarding Copyright Infringement. Claims regarding content (other than copyright).